You have created your Avatar, chosen a Team and familiarized yourself with the main menu. It is now time to take your first real steps in the world as a Pokémon Go Trainer! After taking your first steps, you will notice different points of interest on your map. These locations include Pokémon, Pokéstops and Gyms. Each serves a different purpose and can be interacted with in a different way. Pokémon will generally reside in locations similar to that of their Type. For example, Water Type Pokemon will be more heavily populated near Lakes, Oceans, etc. while Grass and Bug Type Pokemon will be found more often near Woods, Parks, etc. If a wild Pokémon is nearby it will show up on your screen. Simply continue walking towards it and then interact with it to begin the encounter. The game will automatically shift from the bird’s eye map view into a one on one encounter mode between you and the wild Pokémon. To capture the Pokémon, throw a Pokéball at the Pokémon by swiping your finger towards it. If done correctly, you will see the Pokéball fly towards the target. 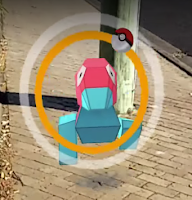 Each wild Pokémon will have a colored ring around it, which represents how difficult of a capture it is. You will want to use more powerful Pokeballs such as Great Balls and Ultra Balls to capture stronger Pokémon. Berries can also be used (once per failed capture attempt) to make a Pokémon easier to capture. 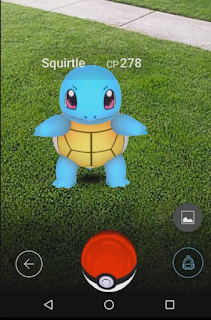 A Berry will actually change the color of the capture ring when used. A wild Pokémon with ??? CP over its head means that it is too powerful to capture based on your current Trainer Level. It is possible to capture these Pokémon, but very difficult. Leveling Up your Trainer will make powerful Pokémon easier to catch. When you first encounter a wild Pokémon it will have a CP value hovering over its head. CP stands for Combat Points and is a major factor in determining how powerful that Pokemon is. The higher a Pokémon’s CP, the more difficult it will be to capture and the more damage it will do in battle. HP stands for Hit Points/Health Points, and represents how much damage a Pokémon can take in battle before it is defeated. 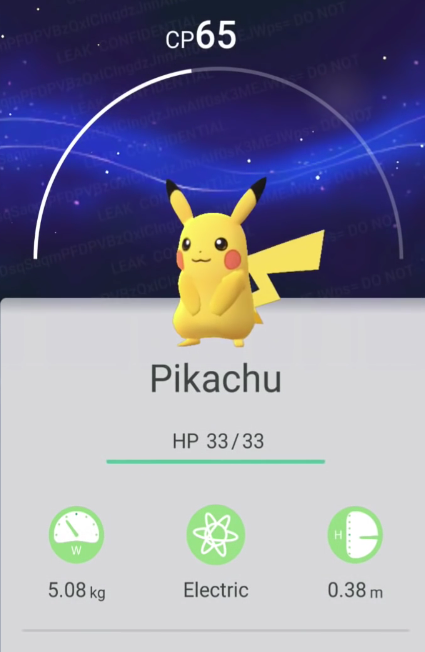 You will want to keep one or two Pokémon of the same species with the highest CP and HP values (Especially those that have Evolution capabilities). Each Pokémon will have either one or two Types, depending on the species of Pokémon. Certain Types of Pokémon are vulnerable to certain Move Types, while other Types may be resistant to the very same Move Types. For example, a Fire Type Pokemon will take more damage from a Water Type Move, while a Grass Type Pokemon will take less damage from a Water Type Move. 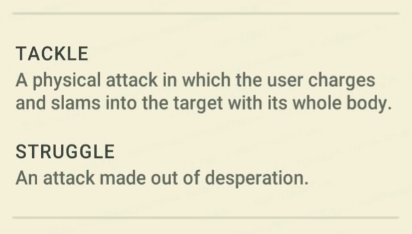 Moves in Pokémon Go are attacks that your Pokémon can use in battle. Each Pokémon will have two Moves. One Charge Move and one Fast Move. Charge Move: A powerful attack that can be performed during battle, but requires Stamina (Energy) to use. Charge Moves can be performed by pressing and holding. Fast Move: A quick attack that can be performed without using Stamina (Energy). When used it will replenish some of your depleted Stamina (Energy). Fast Moves can be performed by tapping. Move Types: In addition to Pokemon Types, each Move will actually have an individual Type as well. For example, a Normal Type Pokemon may have a Normal Type Fast Move and a Dark Type Charge Move.